Biking to work in Downtown Storrs or UConn? 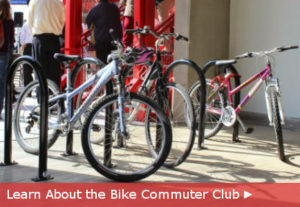 Join the New Bike Commuter Club! Want to tour Bike Commuter Club facilities? See Storrs Center Ambassadors at the Nash-Zimmer Transportation Center, 23 Royce Circle, Monday – Friday from 8 to 5. Or call 860-429-2740 to make an appointment. Ready to sign up? Go to the Mansfield website and click on Bike Commuter Club for the membership application. you can also check out details, including pricing, at this FAQ sheet.